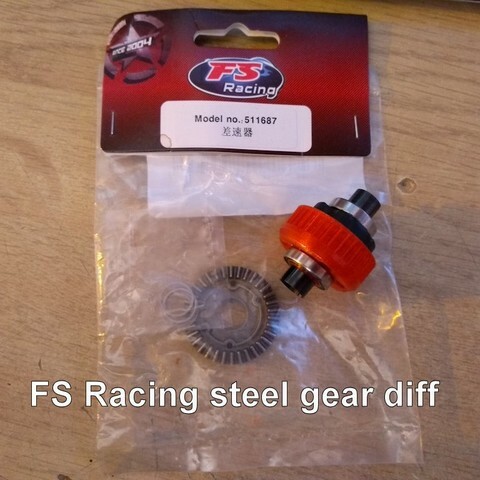 Added option parts to use FS racing steel gear diff (Part 511687). The pulley replaces the outside bevel gear on the FS diff and the spacers are used inside the 12x18x4 bearings on each side of the diff. This diff works with CVD shafts that have <2 mm pin and <6mm ball on the dogbone end. This is the Mk Ultra. 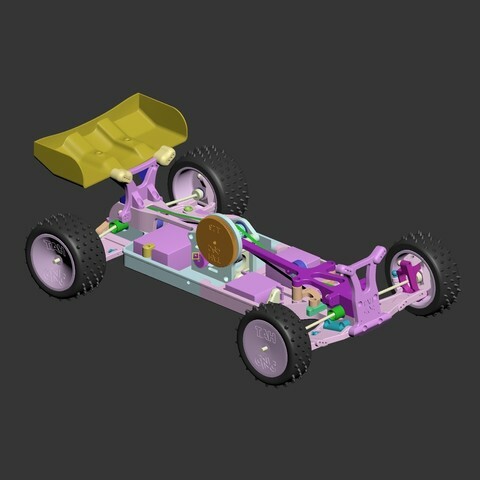 A high performance belt driven 4WD 1/10 scale buggy. It is very sophisticated and capable. The car can withstand plenty of abuse, and is easy to repair and maintain. The prototype runs with a 13,5T brushless sensored motor. -Uses easy to find belts from Schumacher K1 buggy. 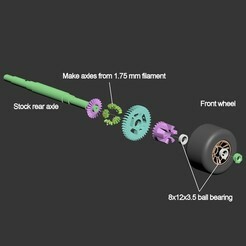 -Can use CV axles from multiple brands (Kyosho, Tamiya, Schumacher, Basher, Quanum, FTX and more). -Wrap around body is held on without clips or velcro and keeps dirt out. -Super precise steering thanks to ball bearings in all hinges. -Radial shock positions ensure minimal height change with shock adjustment. 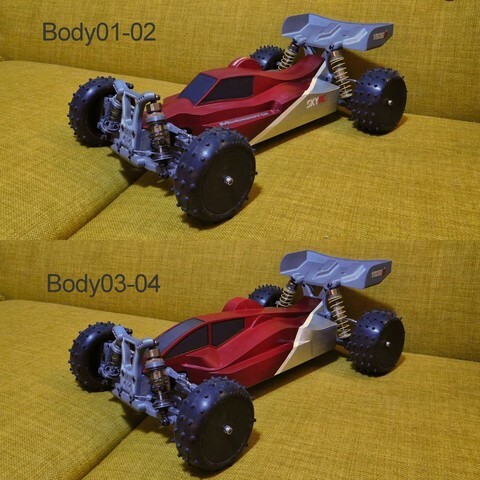 -Printable high strength gear, sealed gear or ball diff option. -Supports FS Racing steel gear diff with adapters. 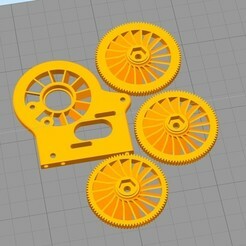 -Printable 48dp pinion and spur gears. -Sway bar option front and rear. -Two body styles to choose from. 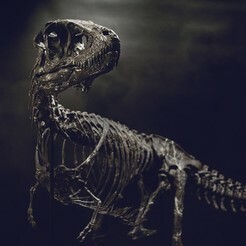 -Designed to comply with ROAR regulations. -Easy to use shorty battery mount without clips. Front and rear track: Adjustable with different hexes. 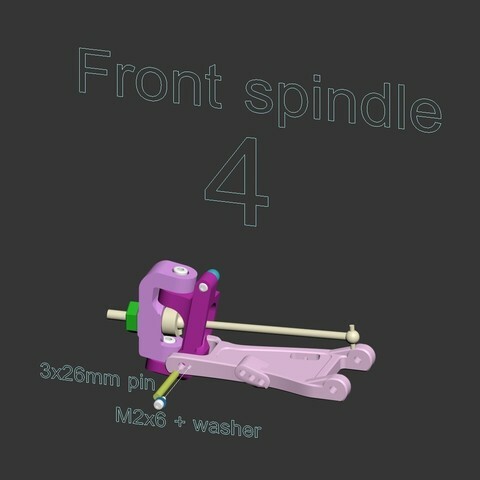 -CVD axles with short wheel axles can use the file "Option - Spindlerear-shortaxle.STLOption - Spindlerear-shortaxle.STL" instead of the regular rear spindles. These are only 10 mm thich from bearing to bearing. -The sealed diffs are the strongest. They use 20 inner diameterx2mm O-rings to keep the grease in. They are not intended to be filled with silicone fluid, but rather made to keep the grease in. -Do not over tighten any screws. Screws threaded into plastic only need to be snug. Stripped threads can be refreshed with a thin layer of CA glue, or just reprint the parts. That's the cool thing about printed cars. -A PLA motor mounting plate can deform if the motor gets hot. If this is a problem, print the motor plate from PETG, ABS or nylon, or another more heat resistant material. 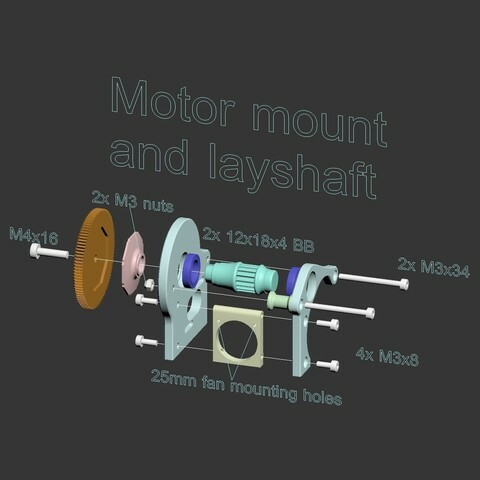 -The middle piece of the motor mount assembly has two small holes for mounting a small 25 mm fan. It will aid with motor cooling by circulating air inside the body and directing it over the motor. -I recommend using a gear diff in the rear if it's difficult to avoid slip. If the ball diff screw comes loos while driving I recommend adding a drop of thin C on the end with the nut after tightening to the correct tension. The nature of PLA is such that it can deform over time and loosen the diff. -Ball diffs must not slip noticeably. If they do the pulley part of the diff will deform from heat. To adjust the diff tension loosen the camber link on the side where the bolt head is, insert an allen wrench and turn the opposite wheel to tighten or loosen. 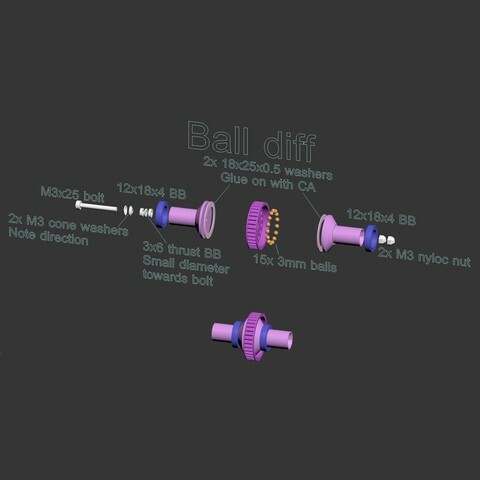 -If the ball diff tension loosens, add a drop of thin CA to the nut end of the diff after adjusting. -Gear diffs spin more freely than ball diffs. Use this info to tune the car. A good starting point is gear in the rear and ball in the front. I suggest starting off with the link in the innermost and uppermost holes. 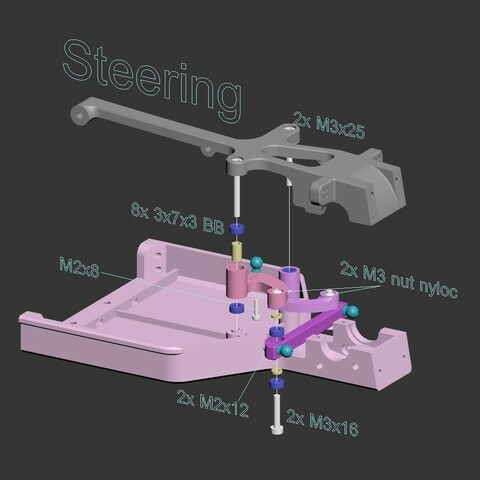 -The option parts contain various rear spindles and pivot blocks for changing the rear anti squat or toe in. 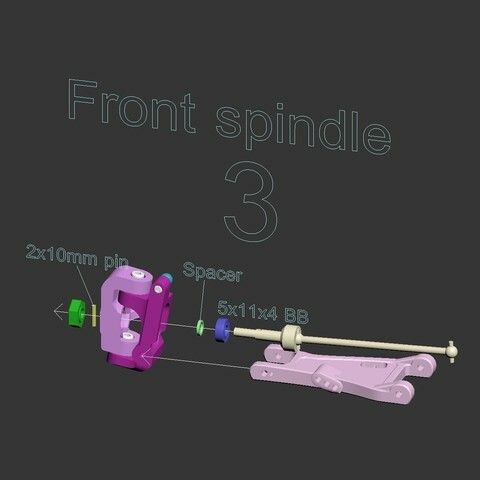 The amount is marked on the parts and should be visible after printing. -I suggest starting with the shocks in the center holes on both top and bottom. -The shock adapters allow the use of aftermarket big bore springs with the suggested shocks below. The stock springs are too hard. -The printable shock pistons are an upgrade from the ones included with the cheap shocks. I suggest one hole and ~550 CST shock oil for starters. It depends on your track and temperature. -The shock covers fit over the top of the rear shocks and screws and protect the shock from damage, while also protecting the track surface from damage. 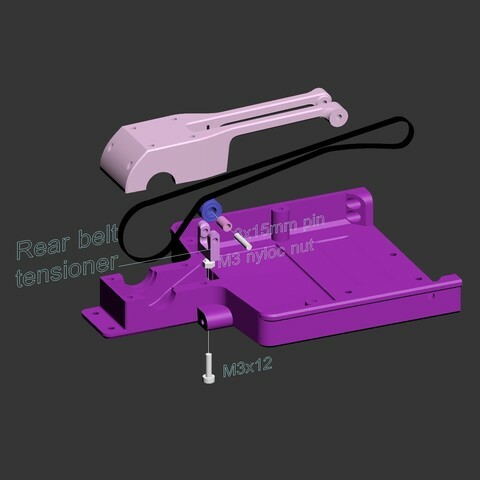 -The rear belt tensioner pushes up on the belt to tension it. It is accessed by a central screw from the underside of the chassis. -The printable wheels have the same offset and width as competition Schumacher wheels. -The body can take some practice to install. The trick is to tuck the nose in first, flex the front edges of the bod around the steering posts and then it will go on quite easy. There is no need to cut to make it fit. Check the video I posted above of installing and removeing the body. -Your motor and ESC of choice? 13.5T sensored recommended. Also available from Ebay sellers. Easy to find. -2x 30mm diameter steel washers for slipper clutch. -2 mm piano wire to make pins. 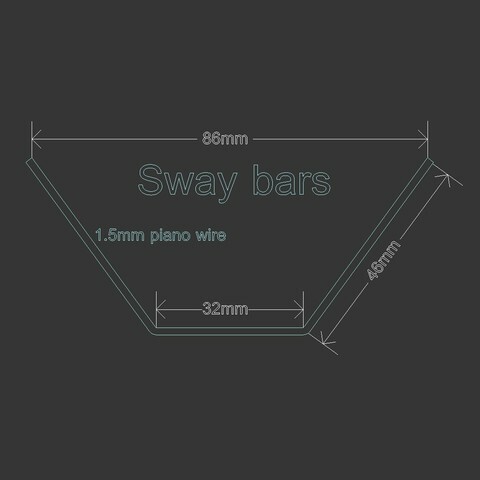 -1.5 mm piano wire to make pins and sway bars. -3x15 mm brass tube for rear tensioner. -2x 3x20 mm brass tube for gear diffs. -2x 3x25 mm brass tube for rear spindles. -2x 3x26 mm brass tube for front spindles. 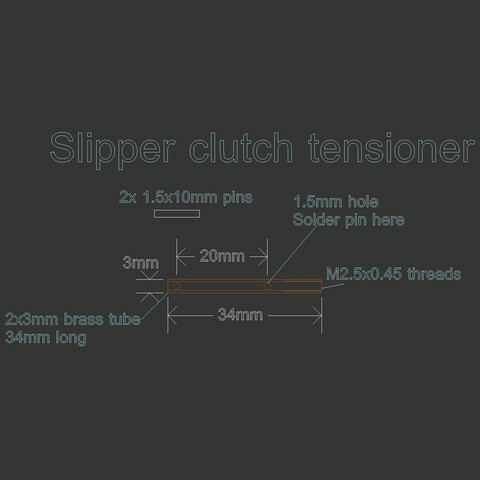 -3x34 mm brass tube for slipper clutch shaft. -2x 3x48mm brass tube for rear suspension arms. 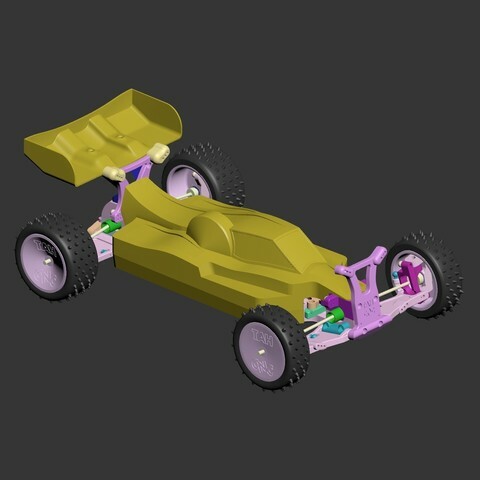 -2x 3x45mm brass tube for front suspension arms. -4x M2x6 + M2 washers. New option parts will appear as new free items on Cults3D. Use 100% rectilinear infill, 0,2 mm layer height and two perimeters for everything except for the body and tires. The car will be very underweight for its racing class if it's not printed solid. The slipper gear needs support. The wheels need support on the inside. This support is easiest removed by twisting it after printing. This usually leaves a clean surface. Use 5% infill and one perimeter for the body. The body needs support under the rear area. I suggest 10% infill and three perimeters for the tires. Your mileage may vary as printing elastoemers is an art. Use maximum 0,1 mm layer height for the links and balls and test fit and calibrate the printer accordingly. They will need pliers to click together the first times and should be slop free with only slight tightness at first. Differential for OpenRC F1 car. I've added parts now to adapt an FS Racing steel gear diff (FS part number 511687) for use with this car. 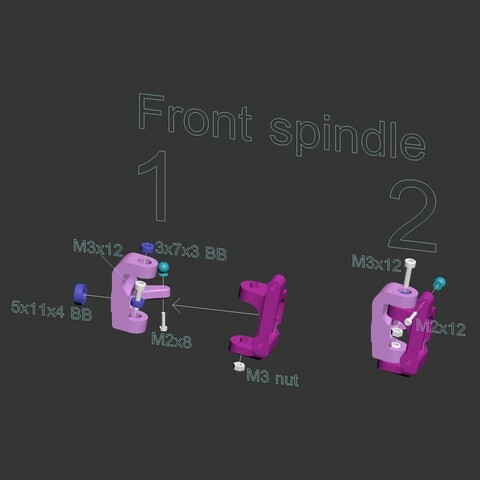 The diff works together with CVD shafts or dogbone shafts with <2 mm pins and <6 mm ball on the dogbone end. A printable pulley replaces the external gear that the diff comes with, as pictured in the photo with the bag. I have also researched different CVD brands to find suitable ones. It looks like many can be used. Schumacher CAT CVD's, Kyosho ZX6 CVD'z, Tamiya Top Force CVD's and probably many many more seem to be suitable. There might be a need to shim slightly, but that's easy to do with printable shims like the one that is used for BSR BZ-444 rear CVDs. Custon CVD's can also be made easily by cutting the length and brazing together, or even using boat shaft adapters to hold the two ends together after cutting. It's a DIY car after all. Being able to make and adapt parts like this is a valuable skill in the model world. Thanks. The only real weaknesses of the design is the low temperature resistance of printed plastics. The diffs, motor mounting plante and slipper can overheat and deform when printed from PLA. I'm hoping a new wonder material comes around soon that has the stiffness and ease of printing of PLA and the heat resistance of ABS. Update: I have ordered some cheap steel diffs and CVD shafts from Banggood which I will try to see if I can integrate into the design as an option. I have a very fast LRP S10 Blast, but it is heavy and constantly breaks - it is driving me nuts. What I could replace by aluminum I have done, but even the short metal axes snap. And the last damage was that the rear end broke off as the rear diff split in half. The thing is too powerful and jumps too far ;) On top of that, the model is very outdated and sources of supply are drying up. 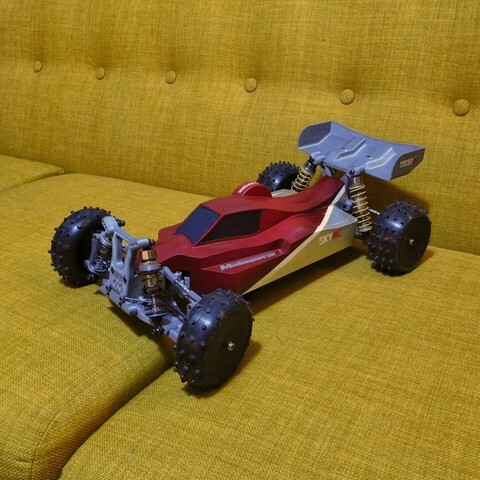 After looking at many RC car designs and video's I think that a light RC Buggy might be the way to go and that it could possibly survive big jumps and rolls, but I’m not alone on the track. I cannot imagine that this/your great design would live when a 1/10 Traxxas is hitting you or lands on top after a big jump. How do you see this? 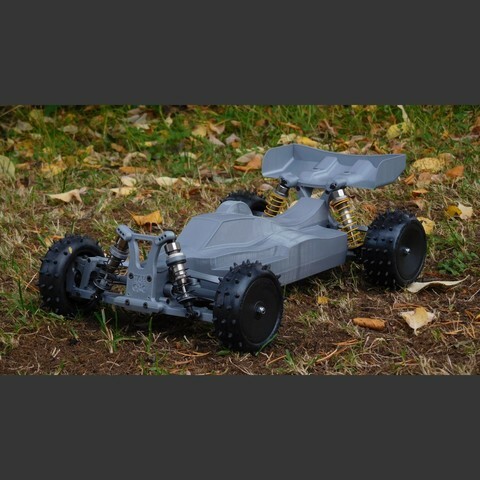 can your design (or basically any 3D printed RC car) withstand the rough environment of racing & jumping & banging on the track? Again, thanks for your work and I’m looking forward to your insight!